Should I drop H2 Econs? For those who start J1 with 4H2s, the period after receiving your promo results is when many students start to seriously think about dropping one H2 subject to H1. For others, even after receiving dismal results, you decide to bear with it in J2, only to find yourself doing badly in Prelims. The thought of dropping an H2 then resurfaces. That was the situation I was in when I was in J2. Regardless of which stage of JC life you are in right now, for those thinking: Should I drop H2 Econs? – You are probably facing one or more of the problems below. While I chose to drop another subject eventually, here are some pointers for students facing each problem to help you in your decision-making. To note: I shall assume that student is struggling for all 4H2s and deciding which subject to drop out of the 4. Because if you are doing well in other subjects other than Econs, the question is not about whether you should drop Econs specifically, but whether you should drop any subject at all. After getting back your CTs/Promos/Prelim results, you find that you have (once again) fared the worst for Econs. In this case, I have separate advice for J1s and J2s. J1: Since Econs is a new subject to you, the learning curve for everyone is very steep. Personally, in J1, I had many unresolved doubts about economic concepts. I knew roughly how they worked, but I didn’t know enough to be able to explain them confidently to another person. However, as I did more Econs in J2 and became more familiar with the subject, there were many instances where things just *clicked* and I became much clearer about the concepts. Many people improve greatly in J2, with much practice and hard work of course. So while it may seem like Econs is your weakest subject now, I would say there is still hope. J2: Sadly, there isn’t much time left and your room for improvement is generally limited. At this point in time, if Econs is your weakest subject and you do not have external help/are almost sure that you won’t be able to do well, just drop Econs. 2. The workload for H2 Econs is too much. H1 Econs seems much easier to handle. That is definitely true. H1 has fewer examinable topics and the exam format is less tedious as well. But you have to take note that this applies for all subjects! Will dropping to H1 Econs give you the largest decrease in workload compared to dropping other subjects? The biggest difference, though, lies in the exam format. I have created a table to compare the exam formats for H2 and H1 Econs. If you find that you do better in essays, is it worth it to drop to H1 Econs, where Paper 2 is only 30% of your final grade? 3. I can’t seem to improve for Econs no matter how hard I work. With the right study approach, Econs is actually very straightforward to study for. 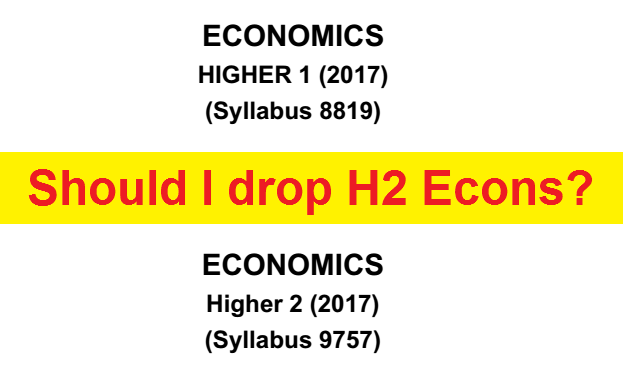 If this is your main problem with H2 Econs, I would advise you to take a chance and reserve your decision to drop H2 Econs. Head over here to read our post on “How to study for JC Econs”. What study tips can you take away? How can you adopt them to study better? I would say that Econs is the most “common-sense” subject and most students will see large improvements after they study right and seek external help. 4. I have the least interest in Econs. When faced with this problem, it will depend ultimately on your own perspectives. If you think that dropping Econs will give you more time to improve on other subjects that you enjoy more, drop H2 Econs. However, if you are performing worse in other subjects though you enjoy them more, the practical move would be to drop one of those subjects instead of Econs. To nip this problem in the bud, examine the reasons why you dislike Econs. Is it because of any of the 3 reasons above? Seek help ASAP so that you can work towards a good grade for Econs happily. Econs is rarely a prerequisite for admission into any local uni course. However, for some courses like Business, there are some modules where my prior knowledge of JC Econs really helped! Also, deciding whether to drop Econs when you are in J1 is a different situation from when you are in J2. There is limited time for the JC2 student and if you are sure that dropping Econs will get you a better grade for H1 Econs and more time to study for the rest of your H2s, do drop it ASAP. Hopefully, this has helped you organize your thoughts better. If you find that you need further help and guidance for Econs, let us know ASAP so we can start working on Acing your Econs together. Till next time.